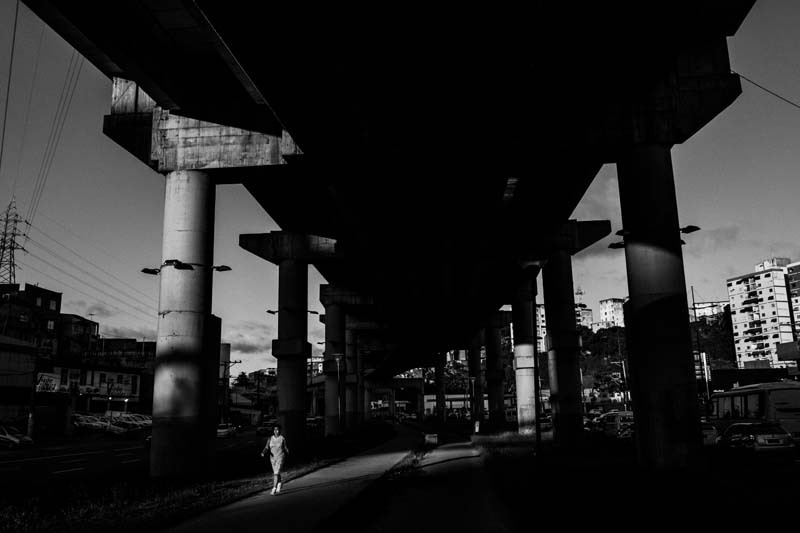 SALVADOR, BRAZIL - FEBRUARY 13, 2014: Residents exercise beneath the abandoned metro system on February 13, 2014 in Salvador, Brazil. Construction began on the metro system 13 years ago, but it has never functioned. A new concessionary signed a contract for the maintenance and management of the metro last year and promises to have at least part of it functioning in 2014. Brazil plowed billions of dollars into building a railroad across arid backlands, only for the long-delayed project to fall prey to metal scavengers. Curvaceous new public buildings designed by the famed architect Oscar Niemeyer were abandoned right after being constructed. There was even an ill-fated U.F.O. museum built with federal funds. Its skeletal remains now sit like a lost ship among the weeds. As Brazil sprints to get ready for the World Cup in June, it has run up against a catalog of delays, some caused by deadly construction accidents at stadiums, and cost overruns. It is building bus and rail systems for spectators that will not be finished until long after the games are done. But the World Cup projects are just a part of a bigger national problem casting a pall over Brazil’s grand ambitions: an array of lavish projects conceived when economic growth was surging that now stand abandoned, stalled or wildly over budget.